Although the current employment reports indicate an increase in jobs, the sad truth is that the jobs people are lucky enough to get are not enough to spur real growth. Why? Simple, the typical wage earner earnings are not keeping up with inflation and that means that there is little if any discretionary income left after paying for the bare necessities of life, for extras. The impact on the economy is that growth will be slow and because of this, hiring will also be slow. Zero interest rates have inspired most companies with good credit to go to the market and refinance their debt as well as financing stock buy-backs. This is positive for the company’s bottom line and also, using buy-backs financed at extremely low cost, increases the value of the company and decreased the float on the issue. Smart reaction to an unusual situation created by a Fed bent on keeping interest rates artificially low. We have read that the stock market will continue to rally until interest rates begin to ratchet higher. We disagree with that take on the market and in fact believe that an increase in interest rates would tell the investor that the economy is picking up so much that the Fed believes it needs to be slowed. Thus, stock prices will continue higher for a short time after the first interest rate increase. The only fly in the ointment would be if inflation, as measured by the Fed begins to boil and move higher causing a swift reaction by the Fed and a swift retreat by the markets. Remember the Fed measures do not include the cost of food and basic necessities of life so even though most of us feel inflation, the Fed doesn’t see inflation…..nice! Railroads have increased carloads by 3.6% year over year. The commodities with the greatest growth are crushed stone, sand and gravel up 13.1%, grains up 16.5% and petroleum up 8.6%. The railroad industry seems to believe that the pipeline will never get done and they are bulking up for more petroleum traffic. The S&P 500 retreated two points in the Thursday session leaving an inside day on the chart. We have a 13 count on the chart and all the indicators that we follow herein are issuing sell-signal. That said, the signal is one of being overbought not a real sell all the stocks signal. It is telling us that it is likely that we will back and fill and perhaps even retreat in an effort to cleanse ourselves of this condition. The 5-period exponential moving average is 1969.10. The top of the Bollinger Band is 1977.89 and the lower edge is seen at 1919.53. The very steep upward channel lines are 1990.52 and 1971.36. To be clear, this market could retreat to 1909 without breaking the uptrend line. Here are some horizontal levels of support for this market: 1959.75, 1936.25 and 1919.00. We are above the Ichimoku Clouds for all time-frames. The Market Profile chart shows us in a clear uptrend with no overhead resistance. 30.4% of Thursday’s volume was seen at 1976. The 60 minute 0.1% by 3-box point and figure chart looks very bullish and has nothing that would make us believe that a downdraft is coming. The daily 1% by 3-box chart continues to have an upside target of 2278.81. We remain a reluctant bull. The trend is clearly to the upside, however; we will see a correction eventually and will continue to recommend keeping your stops tight and trailing. Plainly that means as the market rallies the stops travel to the upside with the market and remain firm on retreats. Yes, they will eventually be elected but that is what they are there for. If you are wrong, you can always jump back in. The NASDAQ 100 retreated two points in the Thursday session giving back 0.05% on the day. We have a 13 count on the chart and we are trading above the upper Bollinger Band. All the indicators that we follow herein are issuing a sell-signal. Again that does not mean sell everything because the market is going to collapse but rather become alert that the momentum is beginning to fade a bit. The Bollinger Bands are beginning to expand anew and that tells us that more volatility is returning to this market. The 5-period exponential moving average is 3890.99. The top of the Bollinger Band is 3911.28 and the lower edge is seen at 3722.61. The upward trending channel lines are 3922.10 and 3753.18. We expect to see support for this market at 3825 and 3736.50. So long as we stay inside the channel lines, expect to see the market plow higher. The low volume seen on this advance in both the S&P 500 and NASDAQ 100 can be attributed to the holiday shortened week and shortened Thursday session. The rally has been a low volume advance which is of some concern. Again, we recommend tight trailing stops on any long positions. The daily 1% by 3-box point and figure chart has an upside target of 3978.30. This is a very bullish chart. The 60 minute 0.1% by 3-box chart shows that this market has achieved the prior targets. We are above the Ichimoku Clouds for all time-frames. This is an exceedingly bullish chart. This is a bullish trending market but one that needs to be watched. The Russell 2000 retreated in the Thursday session losing 1.60 points. The current high for this index is 1210.70, just a cat’s whisker away from the high printed on July 1, 2014. We have a horizontal resistance line at 1205.27. Should that fail to hold down this market, expect to see the high tested and perhaps removed. Remember as we make new highs there is no overhead supply to put downward pressure on this market. The upward trending channel lines are 1227.07 and 1176.90. The 5-period exponential moving average is 1197.43. The top of the Bollinger Band is 1206.76 and the lower edge is seen at 1148.84. All the indicators that we follow herein are issuing a fresh sell-signal, again should be viewed as a caution flag rather than a sell-signal. 19.8% of Friday’s volume was seen at 1202.50. Please remember that this was a holiday shortened day. Crude oil retreated in the Thursday session ending the closing down for each session this past week. We are above the Ichimoku Clouds for both the daily and the weekly time-frame but are in the clouds for the monthly time-frame. The Bollinger Bands are contracting. The 5-period exponential moving average is 104.45. The top of the Bollinger Band is 107.37 and the lower edge is seen at 103.40. The downward trending channel lines are 105.05 and 102.31. The crude oil market closed right on the horizontal support line in the Thursday session. There is another horizontal support line at 101.87. We are getting mixed signals from our indicators with the stochastic and the RSI continuing to point lower, albeit at oversold levels, and our own indicator curling to the upside and telling us that it will likely give a buy-signal in the next session. The 60 minute 0.1% by 3-box point and figure chart has a downside target of 100.25 and hasn’t an uptrend line in sight. We do have downtrend lines and seem to be defending the 103.20 level. The daily 1% by 3-box point and figure chart has an upside target of 136.38. It is interesting to note that this chart looks very range bound. The Market Profile chart tells us that there is plenty of overhead supply and it will be difficult for this market to run to the upside. Gold retreated in the Thursday session leaving a doji candlestick. 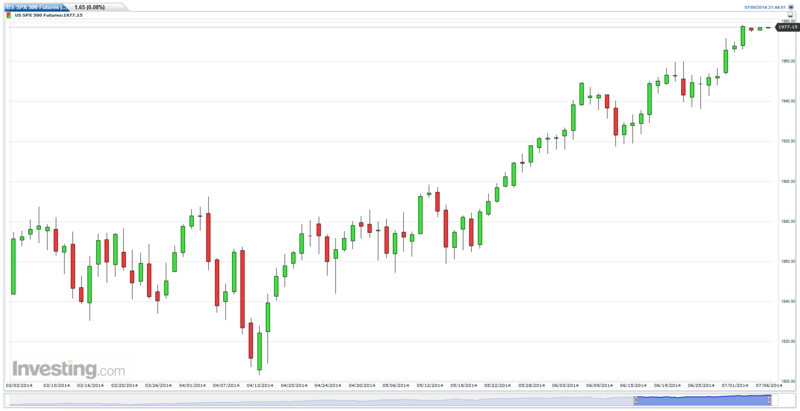 A doji is thought to indicate that the market is in transition and represents a market that could neither retreat nor advance because it was evenly matched. Many times a doji indicates that the market is getting ready to change directions. This is more hit or miss and cannot be relied upon as a great signal but it does put the chartist on notice that something is going on that needs to be watched. All of the indicators that we follow herein are issuing a sell-signal, another message that alerts the trader. The 5-period exponential moving average is 1322.23. The top of the Bollinger Band is 1353.08 and the lower edge is seen at 1246.26. The downtrend line is seen at 1330.40 and the uptrend line is at 1310.00. The pattern seen was a cup and handle. This indicates to us that the market is likely to rally from this area. The 60 minute 0.2% by 3-box chart has an upside target of 1367.56. There are no current downtrend lines and the chart looks positive. The daily 1% by 3-box chart has both upside and downside targets. The upside target is 1812.66 and the downside target is 1113.19. We do have a very strong downtrend line and several internal downtrend lines and a single uptrend line. 46.1% of the volume was seen, on the weekly chart, at 1325. We remain a cautious bull on gold. Cautious = we could change our minds in a nanosecond! The US Dollar index rallied in 4 out of 5 sessions, closing the week at 80.305. The 5-period exponential moving average is 80.164, which the market is currently above, and the 20-period simple moving average is 80.35, which the index is currently below. The top of the Bollinger Band is 81.024, the lower edge is seen at 79.777 and the bands are currently expanding, just slightly. All indicators that we follow are currently issuing buy-signals. The daily candle chart shows we are currently approaching the upper limits of channel lines dating back to June. Should the index break above this channel line, resistance will be seen at the horizontal line, 80.62. On the downside, support basis the horizontal support line is at 80.14 followed by 80 flat which should be periods of pause on movements the downside. The 79.65 level continues to be a strong horizontal support line when looking for a movement to the downside. This market is clearly stuck in a trading range and until or unless either side gives, we will remain as such, stuck. 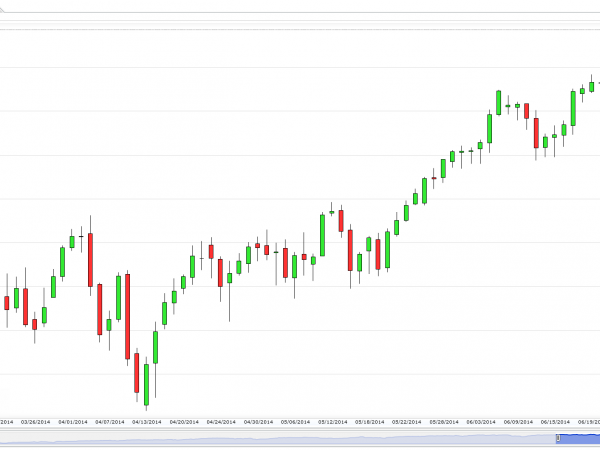 The weekly candle chart clearly illustrates a market in serious consolidation mode. A point of inflection is clear on the chart for the coming months ahead. The support and resistance lines identified earlier are further supported on this chart. The 30 minute .05 x 3 point and figure chart shows this market is still in a down trend with two activated downside targets of 79.70 and 79.95. There is currently one activated countertrend upside target of 82.70 and one counter trend internal trend line. Until the market gives us a direction either up or down, we will wait on the sidelines.